When I had extra Meyer lemons to use up, I decided to preserve them. My intention was to try that famous Moroccan chicken dish with olives and preserved lemon. Well, life got in the way, and that has not happened yet. It will. Something even better happened though! The Moroccan inspiration was definitely in mind one night when I threw together a last-minute meal for some friends. I had a beautiful leg of lamb that had to be eaten before we left for a trip, so I called some friends and said my friends’ favorite five words, “please, come eat my food.” That’s the kind of generous friends I have. In a pinch, they’re always ready to lend a helping stomach. 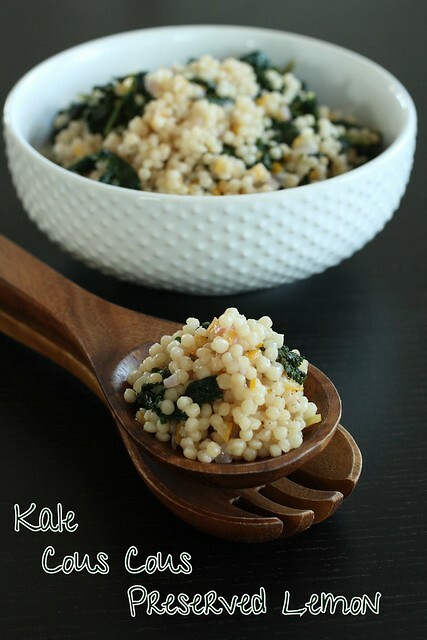 I needed a side-dish and out of my head popped Cous Cous with Kale and Preserved Lemon. Of course, having kale that I also wanted to use up guided my inspiration. The dish worked so well though that I immediately tried to replicate it when we got back from Sanibel and Captiva.